Our veils are 2 tiers (Aprox. 20'' and 24" Long) Made of white tulle with a 3/8"satin edge. 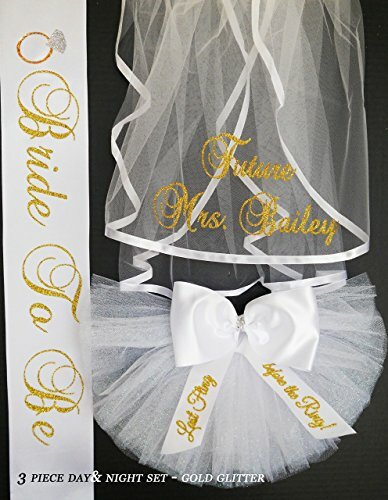 : Veil is PERSONALIZED and will be created with the words "Future Mrs. xxxx" UNLESS otherwise specified Our sashes are classic elegance with a sprinkle of bling. Sash will be created with WHITE satin (unless another color is requested) with the words "Bride To Be" and Veil will be PERSONALIZED with the words "Future Mrs. xxxx" Sashes are satin and 72" long and 4" wide. This set comes with FREE BLING RING on the sash (a $5.00 value). Booty Covers are made of tulle and come in an array of colors. Booty Covers (Bikini Veil) come with a 4" satin bow and PERSONALIZED ribbon. The ribbon color will be white satin unless another color is requested. You can choose the type of lettering ie. GLITTER or SHINY and the color of lettering. They easily CLIP on. What a great keepsake! A must have for Vegas, Miami and the Islands.